Now that we’re finally in sight of the finish line with our kitchen renovation (see updates here, here and here), I’m starting to gather inspiration for my favorite part of the process – decor! You all know that I’m trying to channel my best Joanna Gaines and infuse farmhouse style into our space, so Fixer Upper and Pinterest (duh) have been my go-to resources for kitchen decor inspiration. 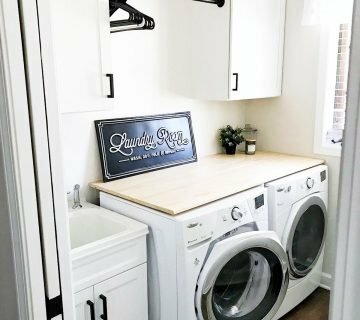 Since rustic farmhouse-inspired decor is ridiculously popular at the moment, it can be a little overwhelming to sort through all the elements that people deem “necessary” to achieve that look. 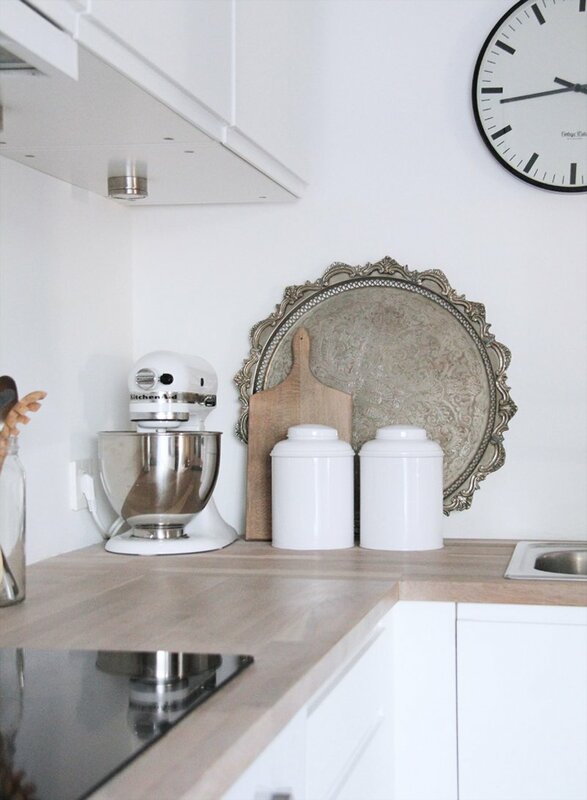 Trust me, I’ve become more than a little stressed at the task of completing my picture-perfect kitchen – we are spending so much money on the renovations that I don’t want to make a silly mistake with decor and junk up the whole space! Luckily, with Ryan’s help, I’ve been able to narrow down the few key elements that I want to incorporate into our space and solely focus on finding or DIY-ing those pieces. I’m such a sucker for these signs (just like the one that Candace custom-made for our family room), so I knew that I wanted to hang one above the window that’s over our sink. Come to find out, these signs are super easy to make so I’m currently in the process of creating one myself for the space. Paired with our white subway tile back splash, it’s going to look straight out of a country house magazine! Okay, maybe not quite to that extreme, but you get what I’m saying. Replacing a double cabinet with open floating shelves might be one of the best decisions that we made in the kitchen design process. Not only will they still serve a functional purpose, but they’re pretty, too! While my favorite cookbooks will be the focal point, I also want to incorporate some greenery and decorative kitchen pieces, such as pretty china dishes, serving platters, etc. I have a hand-embroidered dishtowel that Ryan’s great-grandmother made and that was gifted to me by his grandma at my bridal shower, so I plan to frame it in a shadowbox and put it on one of the shelves. The options are limitless, and a big plus is that I can change things out with the seasons or when I get sick of it. Lastly, I want to put a few pieces on display on the counter top. These canisters that I received at my bridal shower years ago are still my favorite, so those always have a home in one of the corners. I also wouldn’t mind putting out a pretty carving board and/or recipe book stand to add a little interest. Fresh flowers and faux greenery can’t hurt in this space, either! The back splash is being installed tomorrow, and then once our contractor ties up a few loose ends, I’ll be on my way to decorating and making the space complete. Be sure to follow along on Snapchat @msinthemidwest for a few sneak peeks, and I hope to have a final reveal here on the blog in a few weeks. Stay tuned! Are you a fan of farmhouse-style decor? 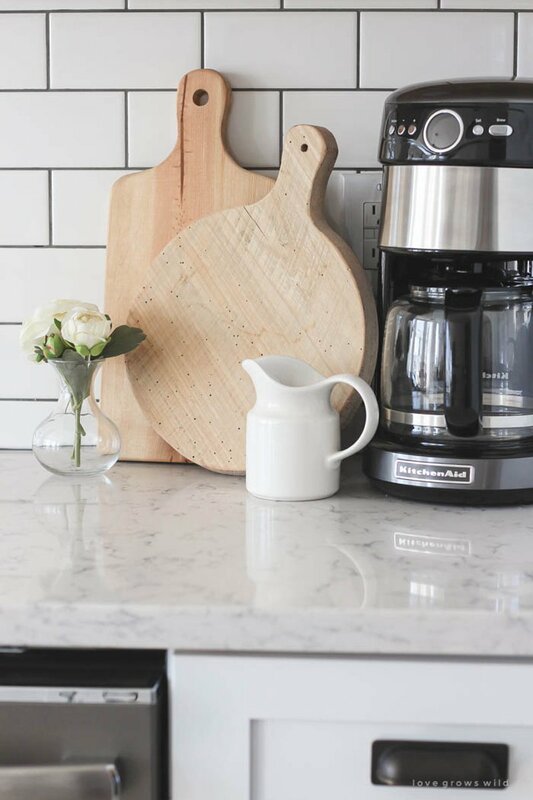 What are your must-have pieces for the kitchen? I’m always on the look out for these. In finding a home inspo, the kitchen is what I look at first. I don’t know why but I’m so attracted to homes with beautiful kitchens. 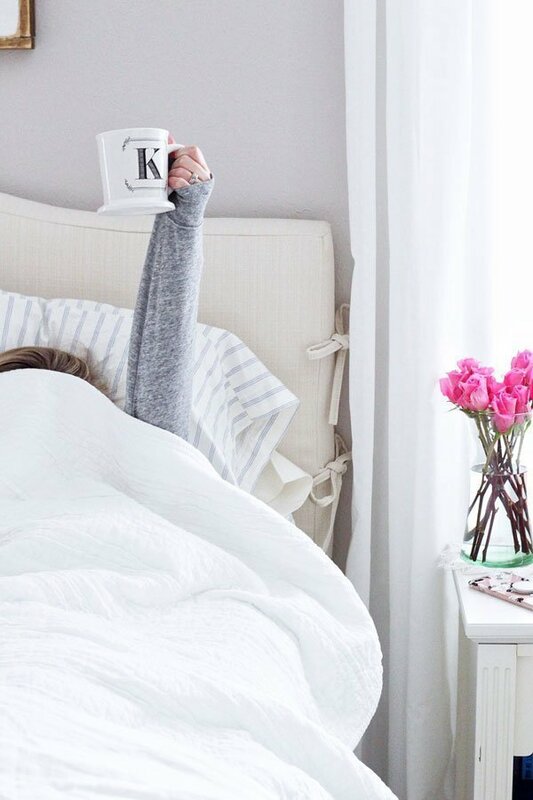 How cute are these decor shots? Your kitchen is going to be so lovely! Thanks, girl – I hope so! 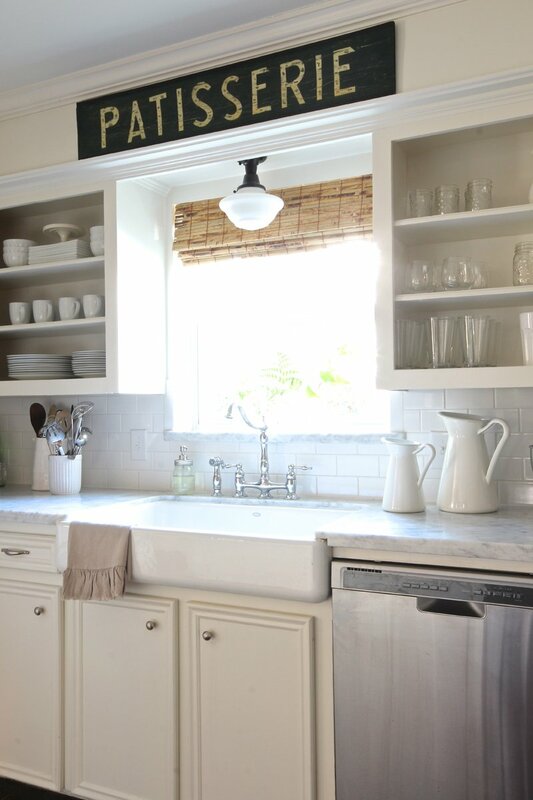 Love everything in this post- I can’t wait to see the sign you make for the kitchen- such an awesome focal point. I’m also so excited for your floating shelves, they’re so pretty and I love everything you’re planning to display. We have zero storage which leads to zero counter space for anything slightly decorative or fun, so I love seeing everything other people pick out! Thanks, lady! I’ve been working on the sign for a couple weeks now (wouldn’t actually take that long if I just dedicated an afternoon to it 🙂 ), and I’m thrilled with how it’s going to turn out so far. 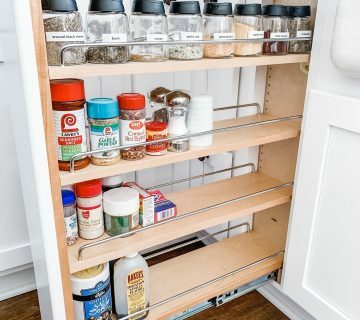 Maybe someday you’ll have more storage in your kitchen! It’s a lot of work, but such a fun project! The farmhouse inspired decor is beautiful! 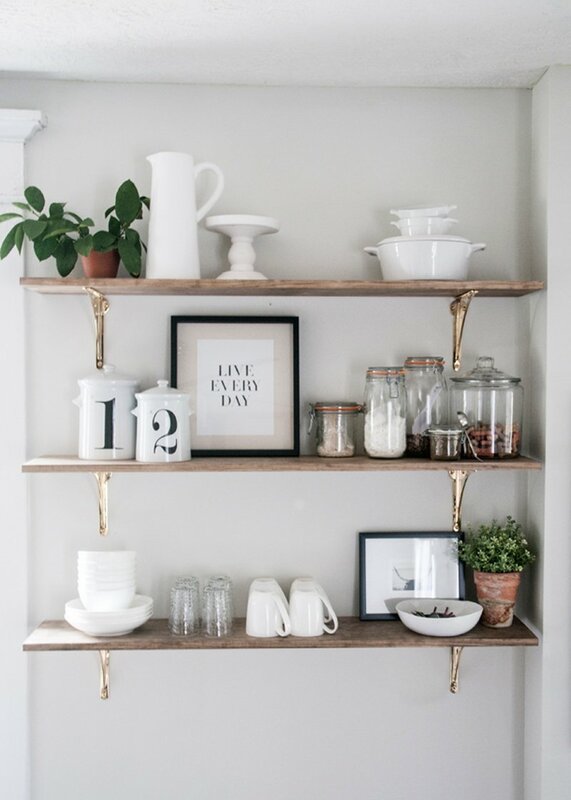 And I’m obsessed with the floating shelves!! I can’t wait to have ours up! I love all your inspiration and I’m sure that you are going to make it look amazing – I can’t wait to see what you do! Can you come to Texas and help me make my kitchen more farmhouse and rustic? 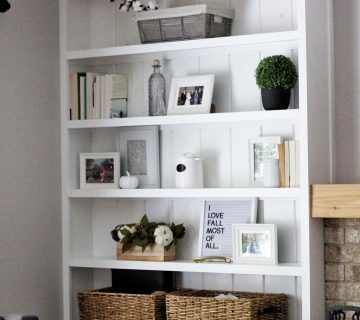 All of your inspiration is so beautiful, and I really love those floating shelves! I have a feeling that I wouldn’t be able to keep everything neat enough for things to be out in the open like that though. Haha, that essentially is my dream job! I told Ryan the other day that I want Joanna to hire me as her apprentice so I can learn all her ways. Oh, and we totally aren’t going to use the shelves to store dishes or anything – I’m not that neat either! The end is definitely in sight! I can’t wait to see how your kitchen comes together – love all your inspiration pics! Thank you so much! So glad it’s finally almost over. Getting so close to being ready for you!! Love these inspo pictures. So excited to hang up my distressed sign, I’m almost finished with it! 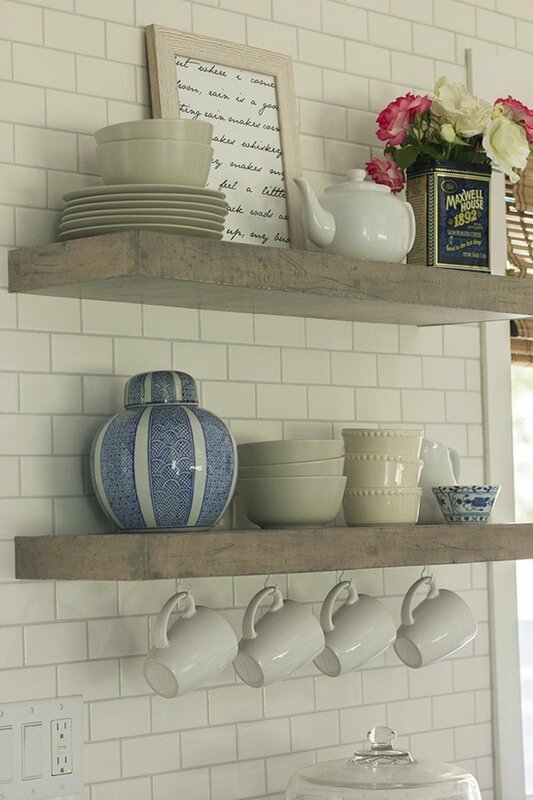 I love floating shelves and want them so badly. I’m so anxious to get ours up and styled! This is so up my alley! My husband and I try to walk the line of modern and clean with rustic touches of wood and metal. 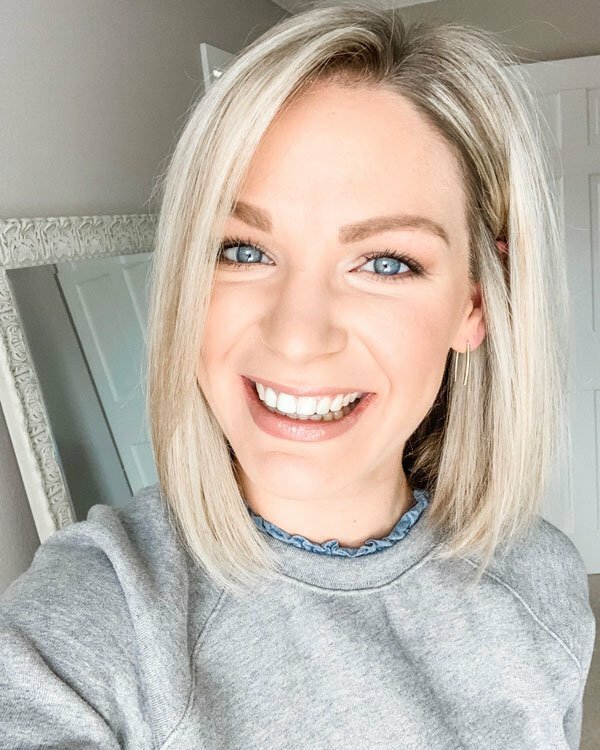 Love it and cannot wait to see what you do! Sounds like we have a similar design aesthetic! Thanks for the kind words! I love all your inspiration! I’m sure once the kitchen is done and you’ve done your styling magic it will look like something straight out of a magazine! Fingers crossed! I’ll probably be consulting you on lots of design decisions! Love it all! So exciting! I’ve been eyeing one of those wood signs too, to go over our pantry. Can’t wait to see your new kitchen! 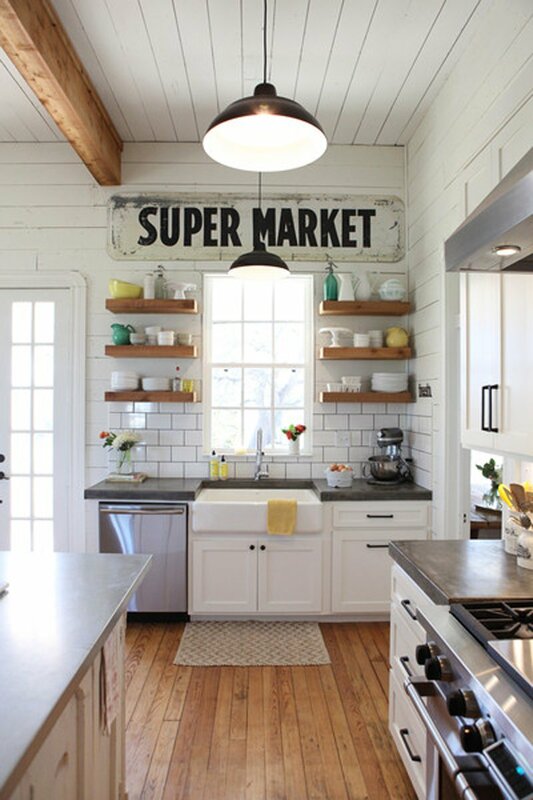 One of those signs would look SO cute over a pantry, I love that idea. They seriously are so easy to make! YES yes and yes to all of this! The perfect farm kitchen! Can’t wait to see what you guys end up with!! So glad you got some ideas for your own big move coming up!